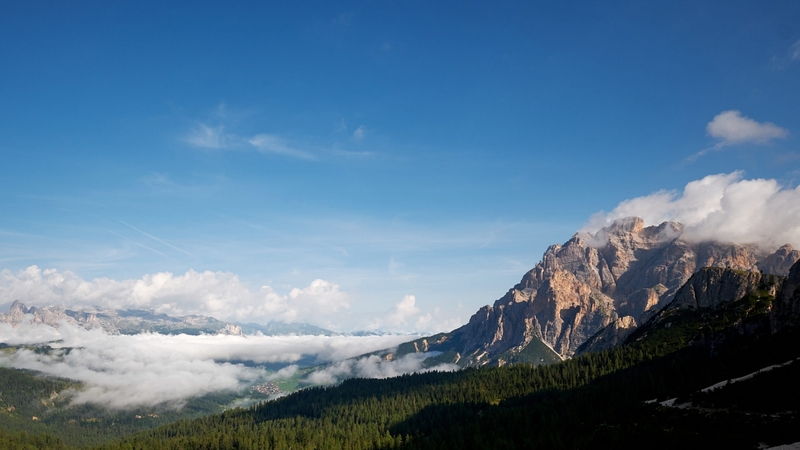 Our destination today is another famous lake in the Dolomites. Located few kilometers from Cortina d’Ampezzo, Sorapis Lake is well known for its incredible turquoise water and the wonderful scenery that surrounds it, with the Sorapis peak dominating the valley. As usual in places like this, there are several ways to reach the destination. Therefore we had to study our options before getting into the car. 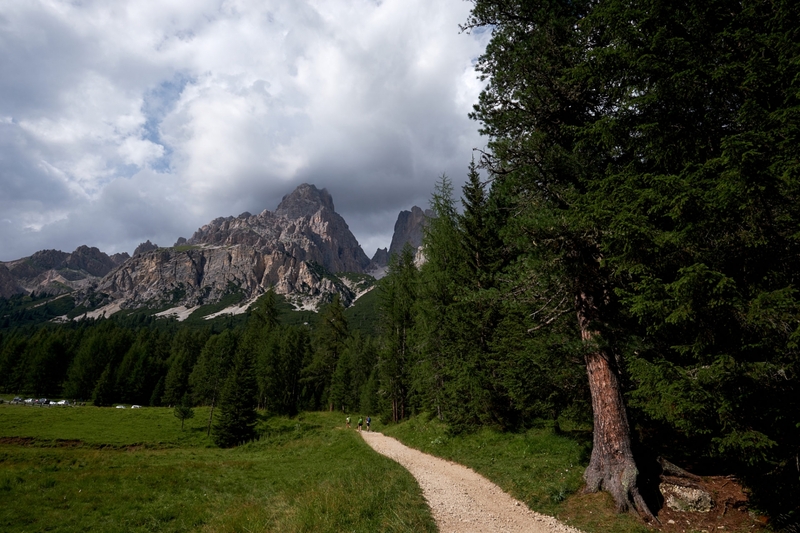 Considering that we walked a lot in the days before and considering that many trails were highlighted as difficult and required special equipment, we decide to go through the easy way, the one starting from Passo Tre Croci and leading through a forest, surrounding the mountain. 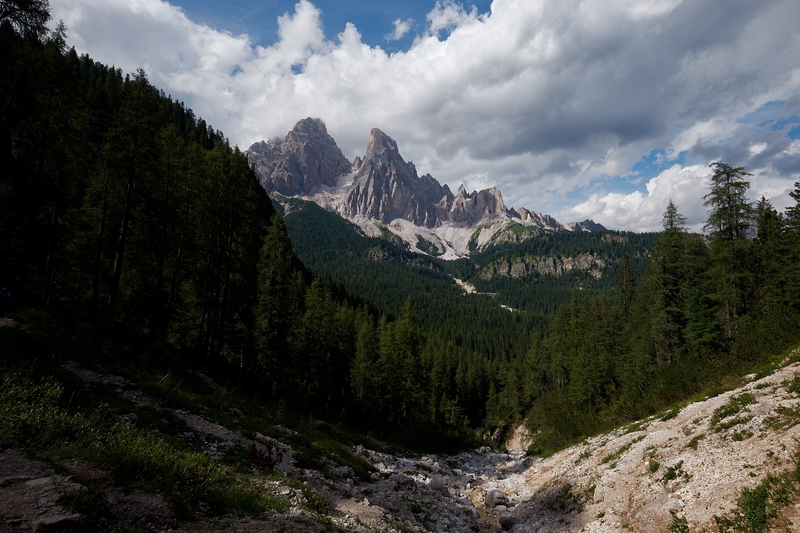 When we get to Passo Tre Croci, we realize that parking our car will not be easy. There’s no clear parking areas, and all the safe spots are already occupied. We don’t have choice but to park on the side of the road, hoping this is not going to be a problem. 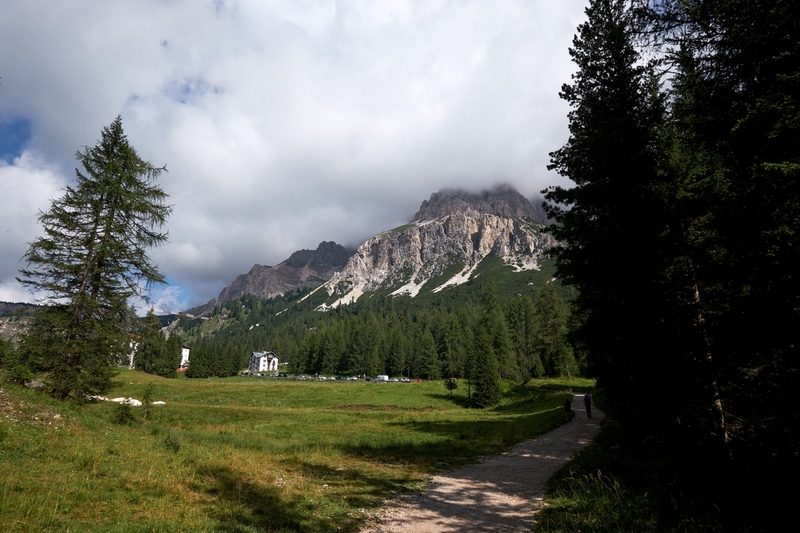 The trail starts in a flat lawn with Monte Cristallo at our back, partially covered in clouds, and a clear path in front of us. 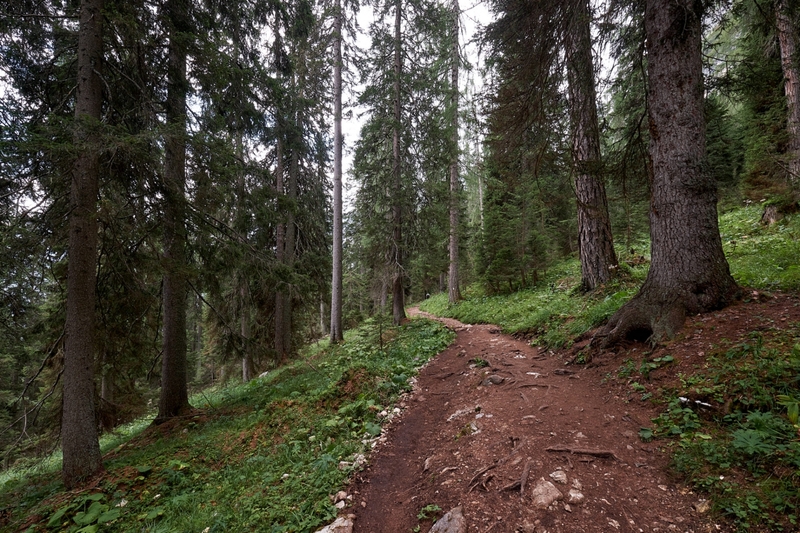 After few hundreds meters the trail enter the forest, and goes on for kilometers without any significant change in altitude. Everything seems really easy. Sometimes the forest opens up, and shows the valley below us, but soon after the trail enters the forest again. 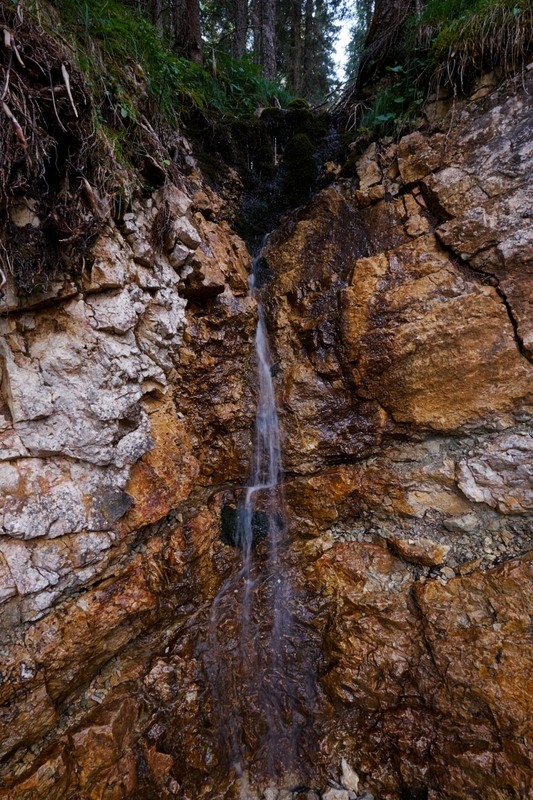 After a few kilometers, probably between 4 and 5 kilometers from Passo Tre Croci, we find a small waterfall on our right, the trail start going up a bit, and trees become sparse. We can clearly see we’re now walking on the edge of the mountain, with a vertical cliff right below us. It’s scary but at the same time it is really spectacular. The trail gets narrower as we move forward until we get to the point that we have to use the steel aids attached to the side of the cliff to go on. The trail becomes hard, on wet rock (morning humidity, even though its almost noon) and steep surfaces. We did not expect to have to face this. It’s only for few meters, then we get to steel ladders that bring us to the remaining part of the trail. The trail now is narrow, to the point that when someone comes on his way back, some coordination is required to get past the other person. In some spots the trail is equipped with metal ropes as it is narrow, with a vertical cliff going down for hundreds of meters. After a few hundreds meters the trail gets again into the forest, the cliff is behind us, and the destination is really close. A few steps and we can finally see Rifugio Alfonso Vandelli, and the lake on our right. The lake is small but, despite the clouds, our minds get blown away by the colors. The water is turquoise, but it’s far more surprising than we expected. 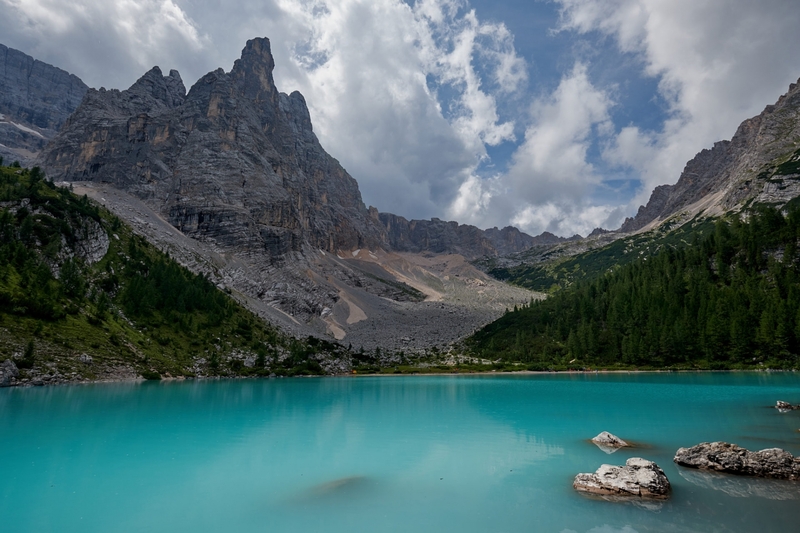 It’s simply incredible… It seems a turquoise milk lake, surrounded by spectacular mountains and trees. The walk was approximately 6.5 Kilometers, with only 150 meters altitude change, but we’re a bit tired, probably due to the difficult spots we had to face. But there’s no reason to complain. The view is well worth the effort, it’s one of those locations that we will never forget. After an hour, maybe more, taking pictures, timelapses, video footage and walking the area, it’s definitely time to have lunch and, today, it’s time to eat in the mountain hoot. The lunch at Rifugio Vandelli is refreshing, generous, tasty. It is exactly what we needed. Before going back to our car, we take some more time to admire the lake… Did I already tell you how beautiful it is? I guess I did. The trail to get to the car is the same we took to get to the lake but, to our surprise, the way back seems a lot easier. It may be due to the fact that the worst part is now completely dried, therefore the feeling below our shoes is not slippery, giving us the confidence to go on in a safer way. When we get to the car the sun is already setting, so we decide to relax, go back home and have a quiet evening. This was another amazing day for us. 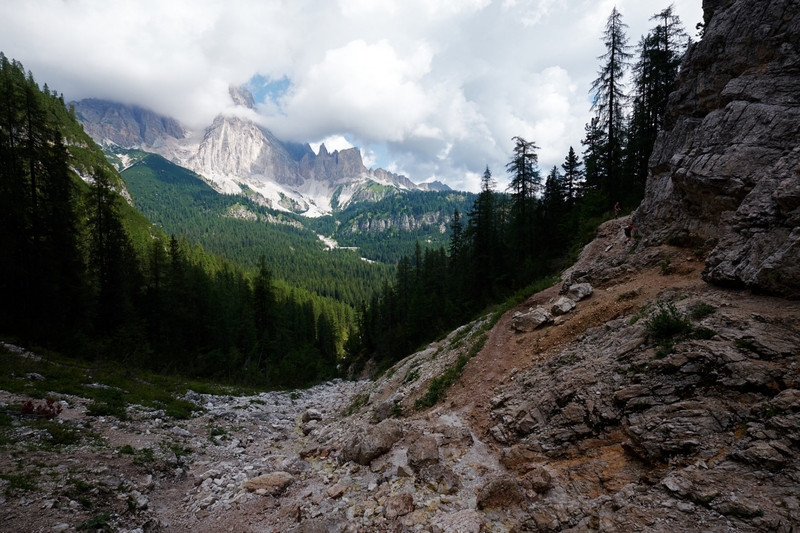 Note: Some of the places shown in the posts from our Dolomites trip were dramatically hit by unexpected severe weather conditions at the end of October 2018. Strong winds and heavy rains damaged several woodland, villages and hiking trails. Images and descriptions on my blog refer to a trip we had almost 3 months before (beginning to mid August 2018). What shown in this blog may differ from what is the current status. I’m not aware of all the damages created by the weather, therefore this general note will be inserted in all the following posts. For those areas that I know for sure were damaged, I will point it out in the description.